I returned from Seoul on 17th, and after spending a few busy days in Japan, I came to Abu Dhabi, the capital of United Arab Emirates（UAE）on 22nd in the afternoon. Approximately 15 Nobel laureates have participated in a conference called "Festival of Thinkers." I have been at the Dubai airport many times but this is the first time I am coming outside the airport. Coordinator of Japan delegation was Dr. Cassim, President of the Asian Pacific University. On 21st late afternoon, I moved from Haneda to Kansai International Airport. In the lounge, I met Dr. Nassrine Azimi, who is joining us this time and we departed by a midnight flight. She is the director of UNITAR in Hiroshima. She is an intellectual cosmopolitan of many accomplishments, a native of Iran, and has completed her education in Switzerland. 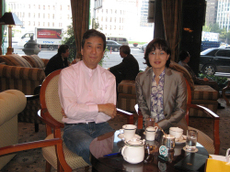 3 years ago, soon after she assumed the office, I went to Hiroshima to attend a seminar (blog: Oct. 21, 2004). A storm was approaching then and there were a big earthquakes known as Chuetsu Earthquake in mid Nigata prefecture. So it was nice to meet her after a long time and I really enjoyed talking with her about various topics. 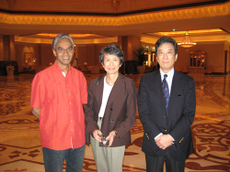 We also discussed about the panel at the conference and I introduced Professor Miyagawa of MIT by e-mail. Dr. Miyagawa is a member of the team which planned the Open Course Ware of MIT, and recently he has started a fantastic program called Visualizing Cultures with Professor John Dowers, a Pulitzer Prizes winner and the author of "Embracing defeat." I have a feeling that something wonderful will come out from the collaboration of Professor Miyagawa and Dr. Azimi. By the way, Professor Miyagawa is staying in Japan this year so I invited him to the National Institute for Policy Studies to give a speech to high school students of Musashi Gakuen. I will write about it in some other occasion(blog: Jan. 4, 2005）. After arriving Dubai airport I traveled towards Abu Dhabi by car for about 90 minutes. There were many new constructions springing out from desert, and everything was very energetic. There was a feeling of "money can do anything." I heard that 60% of the cranes from all over the world were brought here. Leaving the suburbs behind, the car ran and ran through the highway in desert, and as we approached towards Abu Dhabi, trees and greens increased. So I was relaxed. It was also because some of the views reminded me of southern California. The green view s a result of the efforts of Zeid, late great emperor of Abu Dhabi who has taken initiative in tree plantation campaign of "green desert, green country." This is a great achievement. 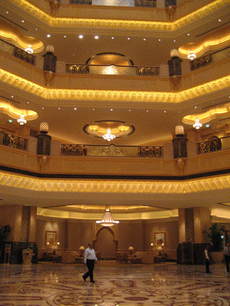 I reached Abu Dhabi early in the afternoon and stayed at the Emirates Palace Hotel (for details, refer http://virtual-emiratespalace-uk.com/). The hotel was huge just like a Palace, with beautiful private beach. I hear that former Prime Minister Abe and many people from the business world had stayed here in the beginning of this year. I heard some stories about it, too. 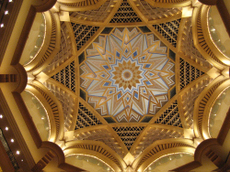 During my stay of three days, I could not understand the structural design of the hotel. I was tired just by walking inside the hotel. 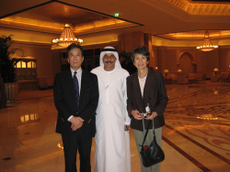 Photo4: Dr. Tayeb A Kamali, Vice Chancellor of HCT (Higher College of Technology), organizer of the conference and Dr. Ishikura. 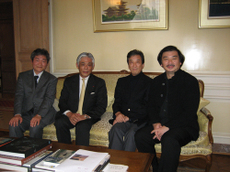 On the same day, I went to the Japanese school in the afternoon, as His Excellency Hatano, the Ambassador invited me. There were approximately 50 to 60 students from kindergarten to 9th grade. I would like to express my appreciation to Principal Mr.Yoshizaki, teachers from Japan and all local assistants for their hard work. Under the suggestion of His Excellency Hatano, four local children were also admitted in the kindergarten. I was told that the school plans to increase the number of local children in each class and the children’s parents appreciate the disciplinary rules, same meals being provided to every children etc. in Japanese school. Such kind of small things will become foundation of building goodwill, exchange of ideas and mutual understanding. My speech was for about half an hour and mothers of many students were there also. It is very difficult to interact with an audience consisting students from 3years old to the students in 9th grade. 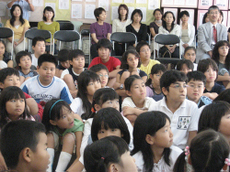 However, I told them that I think the Japanese schools are very much blessed as compared to times when I was in Los Angeles when the Japanese School system (a supplementary school which opened only on Saturdays) began to take shape and the returnee student admission system several years later. I also told them that to experience things that people usually can not experience could be very helpful in future global era and my expectations to the children who will live in global era. "Among the schools you’ve seen, which school was good?" was a very difficult question. Therefore, I told an experience when I had visited last year to Olympic Primary School in Kibera Slum (Reference 1) of Nairobi (blog: Jun. 27, 2006). Children in this slum area face a very hard life, where there is no toilet in their narrow houses, no kitchen, no electricity, dirtiness all around and they are struggling to stay alive every day. All the classrooms overflowed with the students and everyday they commute to school by walking for more than 1 hour. However, I saw a spark in their eyes, they were studying sincerely even in such hard conditions and the teachers were confident too. This school is from grade 1 to 8 and is the top school in Kenya. I told them about my comment "The most moving experience in my life, I see the future of the nation" which I wrote in the guest book. I hope someone will read this comment in the future. I do not know when it will happen but I am waiting for the news. I was happy to answer the wonderful questions from the students. Problems senior students were facing were, naturally, mainly about career options. They were worried about their future like whether to go to Japanese school or about career objectives. It is very difficult for the children and their parents also. There might be some problems specifically because it is a full time Japanese school and not an International School. For example, a girl in ninth grade who came from Egypt. She has a good command on Japanese as well as Arabic; however, she was not sure about her future career options. I recommended that, thinking about the future world, unless she has a definite reason or objectives to go to Japan, she aim at English speaking countries or perhaps the schools having English as the main language. I understood by looking into the eyes of those children that they have a great potential and fighting with the uncertainties/anxiety of being between Japan and foreign countries. I was impressed. I wish everyone a great future and great dreams. 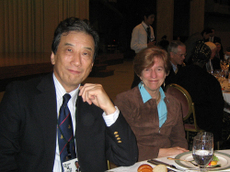 Photo7: Dr. Ishikura, Professor of Lindqvist and Director of Nobel Museum with his wife. Photo8: Dr. Kary Mullis, the famous Nobel laureate in chemistry, inventor of common Gene amplification methods PCR and his friend; Dr. J Barbour, a "Physicist and Author" who writes books on light etc. In the evening, I had dinner at ambassador’s residence and it was a beautiful moment to meet old friends, be acquainted with new people at the assembly reception. 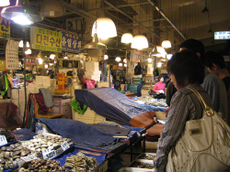 I went to Seoul from October 13th to 17tth. 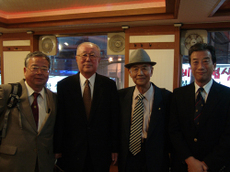 Departing early morning from Tokyo on the 13th, this is to join the reunion I organized of Mr. Sadamu Sasaki, the first grandson of Dr. Gozo Sato who devoted his life to the modern time Korean medical education and Dr. Sato’s 3 students (ages 83-86), which took place in the evening of 13th. 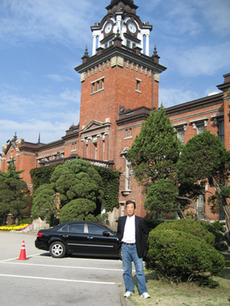 Exactly one century has passed since Dr. Sato went to the Korean Peninsula as a staff doctor of a hospital. 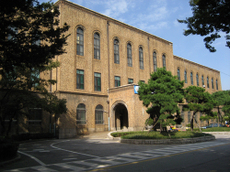 It also marks the 100th anniversary of the Korean Medical Institution (now the Seoul National University College of Medicine). 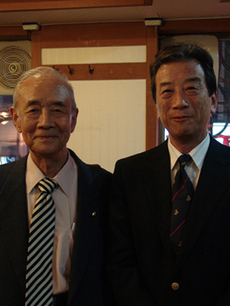 Mr. Sasaki was born and lived in Seoul with Dr. Sato for his initial 14 years. He returned to Japan in 1945 after the end of the world war and this was his first visit to Korea ever since then. What a surprise, what a centennial coincidence. We also visited the house where Mr. Sasaki used to live. I hope that this visit helps to further our understanding of our history between the 2 closest countries and opens a new door to the future. The detail of this visit is reported in Mr. Deguchi’s mail magazine （Oct. 10 and 17 edition） who joined this trip: his background is a journalist, thus write much better and professionally. As he wrote properly of our encounter, the story is much real and very touching; I hope you have a look. 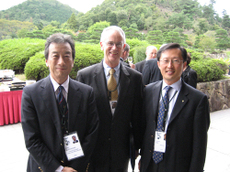 The following day, Mr. Sasaki, Dr. Ishida and I strolled around places associated with Dr. Sato. At night, we had a “luxurious” dinner where fresh fish were cooked in front of us at the fish market. On the 15th, I met with a charming woman scientist, Dr. Narry Kim of the Seoul National University (Photo 6). I wanted to pay this visit because I recognize her outstanding achievement on micro RNA. I wanted to know how she could establish her independent research as an assistant professor while being a mother of 2 children. I will touch upon this on a different occasion. There are things that I can’t disclose at the moment, but please look forward to the story sometime later. 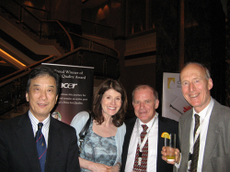 On the 16th, I joined the World Knowledge Forum held at the Walkerhill Sheraton. The following day, on the 17th, there was a Keynote Lecture by Mr. Colin Powell, the former Secretary of State of USA. With no paper, no memo, he talked for 45 minutes right off the reel about Vietnam War, his stay in Korea, his visit to the former Soviet Union during the Cold War, his visit to China, his secret rendezvous with Gorbachev before the end of the Cold War, etc. He shared some specific episodes with us and talked about the current China and expectations for the future. It was such an outstanding well constructed and presented speech with full of grace. After this panel, I went straight to the airport to catch a flight back to Haneda. A few weeks ago, several French journalists visited some 30 leaders of political, government, business and other sectors of Japan. They also visited me. A few days later I received emails from some of them telling that somehow most of interviewees were quite pessimistic about Japan, and it seem that I was perhaps only one who firmly recognized the problems and issues in Japan and what to do with them. One of them wrote in Le Figaro, September 25th issue (document #1) and its Japanese translation (document #2) is attached. #2　Japanese translation　"The aged Japan withdraws into herself"
Interviews with foreign press are of value and should be welcome opportunities for effective public relations. This is an activity report from October 7th to 9th from the following day after I returned back Japan from the selection of UNESCO-L’Oreal prize in Paris. 8 o’clock in the morening on October 7th, I went the BioCamp. This is a “Camp” conducted once in a year by Novartis, the global company, for about 40 young Asian people since 2005 （Refer:1, 2）. The first camp was conducted in Taiwan, and the keynote was addressed by Dr. Yuan T Lee, the 1986 noble prize winner in chemistry. The second camp was conducted in Singapore, and the keynote address was given by the Science Minister Mr. Philip Yeo. And this time, Mr. R. Horwitz of MIT, the winner of medical student noble prize of 2002, and I made the keynote address. There were probably about 40 participants and the male : female ratio was 5 : 5. Amongst them, there were 15 participants from Japan and the ratio was 7 : 3 which shows the large number of male participants （this means that there were more female participants from other countries）. I was a bit sad as I had just selected a woman researcher in Paris the previous day. I came to know later that the event was telecast in the "Mino-Monta’s" morning show on the following day for about 90 seconds, included some parts of my speech. The program reported this camp as an example of that the private enterprise’s contribution towards the growth of young people. I had to go Kyoto just after the address. 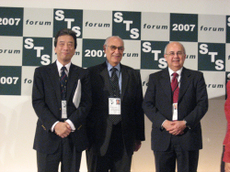 There was the 4th STS Forum. There was a short greeting by Prime Minister Fukuda in the morning session. I could not reach in time for his speech and so I participated from the afternoon session. This year, the event attendees have considerably increased to about 4 times. 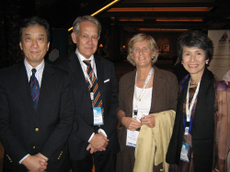 It was a wonderful opportunity to meet the leaders, friends and have new acquaintances （Picture1～4）. The discussion, such as about problems and policies of the world, have progressed quite well since the last year’s conference. After all, there is no doubt that the climate changes or sustainable society are the main issues of the world, from the last year’s conference. In this world’s issues, there are huge expectations to Japan, I think・・・. In this evening, I went dinner with the Science Advisor of British Prime Minister, Sir. David King. Of course the topic was mainly about the G8 summit in July 2008 in Japan. 4 of my staff （member from the Cabinet Secretariat, the Ministry of Foreign Affairs, General Council on Science and Technology and Science Council of Japan） were also participate. Japan is the host country for the G8 summit, and deals with the problems of the world, How are we trying to solve the climate changes and the problems in Africa? How about Japan’s leadership in Asia? I feel this might be a crucial moment for Japan at the beginning of the 21st century・・・. In the G8 summit in Germany, Japan’s contribution was very high though （comparatively I do not think the evaluation within and outside of Japan was good. It is as usual because of lack of communication strategy）, then what can Japan do about the climate change, now? 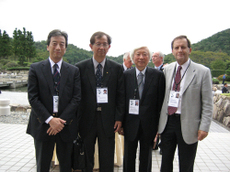 In addition to this, TICAD will be held in May 2008 in Yokohama. In spite of the marvelous opportunity for taking leadership about the Africa issue, it is irritating that "intention of the nation (National Policy)" was not conveyed to the world in any of the themes. I feel this is common sence of the world that Japan cannot be seen in the "rapidly moving world." This can be said that because of the unexpected change of the cabinet, though. Well, what do you think about this? It’s tiring, isn’t it? There is a cosmetic company named L’Oreal. I arrived in Paris in the morning of October 4th. I was invited as a selection committee member of the UNESCO-L’Oreal prize conducted by UNESCO to commend incredible female scientists. The hotel I staied was Hilton which is near Arch of Triumph, the Japanese embassy, and the OECD Office of Japan. I had lunch with the UNESCO Ambassador Kondo in the official residence and got acquainted with Mr. Akiba and Mr. Sakashita of the Science council and also accompanied by Mr. Shigeru Ban, who is a world famous architect （Picture 1）. Presently he visits Paris every 2 weeks each month for the construction of the second centre which he won in an international competition. Moreover, Mr. Kondo, the ambassador, has also a deep knowledge of culture and has also a book to his name called “Paris from the Malmasion Woods: 24 essays about the diplomacy and culture.” Rising above all the expectations, he was deeply involved in the World Heritage selection of Iwami Ginzan at the conference of UNESCO in June. The perspective of “environment” was highly evaluated. This is an era. At the end of June, when ambassador Kondo left Paris CDG airport for a conference at New Zealand, I was waiting at the airport for a flight to Tokyo and so we had dinner together. The selection for the L’Oreal prize was on the 5th, the selection committee head was Nobel prize winner Gunter Blobel and committee members were past award recipients all of whom were great people. An old friend Mr. Nalecz（from Poland） was the representative from UNESCO. I met him after 3 years. 5-10 people were recommended from each continent（North America, Europe, Asia-Pacific, Latin America, Africa-Arab） and since all were incredible it was difficult to choose. 5 people from each region were selected after a lively discussion. Please see the web site for the result. A grand business plan seems to be planned with the ceremony in Paris on the tenth anniversary of UNESCO-L'Oreal prize next March. Up till now, Ms. Tsuneko Okazaki and Ms. Fumiko Yonezawa of Science Council of Japan, had participated as the Japanese winners. 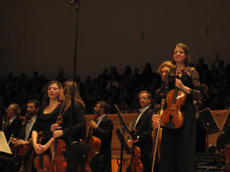 In the evening, I went to the Radio France Philharmonic Orchestra concert. Myung-Whun Chung is the musical director here. The second number of the Brahms Concerto for Piano was played. The conductor was Gustavo Dudamel, and Piano by Leif Ove Andsnes. After the performance I excused myself and went to the Paris CDG airport. I left for home by Air France at 23:30 from the same CDG airport where I had met ambassador Kondo last time. Come to think of it, this L’Oreal prize has excellent global advertising communication strategy. In the global era, this type of special contribution from industries is considered very important as CSR, and is evaluated as intangible value. Hence, it is necessary that the Japanese industries contribute likewise more and more. I was invited by JASDAQ and gave a speech on the 3rd of October. There were approximately 700 people participating. The people were over flooded with enthusiasm but I thought a little more vigour could have been better. Why it was so is hard to explain but it left a docile impression. The host, Mr.Tsutsui, director of JASDAQ and Mr. Izuka of THine Electronics, Inc. (THine) who participated in the panel were with me at Dailian also as I introduced to you a while ago in my blog (click here for article of the interview of Mr. Izuka in Japanese). The panel members were Mr. Eikou Harada, president of MacDonld’s Holdings Japan, Mr. Mineo Fukuda, executive vice-president of Jupiter Telecommunications (J:COM), Mr. Testuya Iidzuka, director of THein and myself under the chairmanship of Mr. Tsutsui. Japan invests extremely small amount to new or growing industries compared to economically larger countries such as in OECD (Figure1-2: why are these graphs not widely used and get known to the media?). I get an impression of "slackness" under the influence of the economic growth driven by more than 30 years of mass-production of standardized goods since 1960’s, cheap energy sources like oil ( until the oil shock of 1974), culture of consumption, the logic drawn from the supplier side as Freeman and Perez put it "the paradigm 4." The feeling is especially strong for these several years since the economic recovery this time came along with the economic growth of Asia, even though the basic restructuring of Japan’s framework is still far from accomplishment. This could be dangerous. Books like "Company rots from its head (published in Japanese only)" or "Tenacity of one finger decided the contest (published in Japanese only)" etc. by Kazuhiko Toyama points out the same problem. Although the world is changing rapidly, it is not able to change as the past experience of success is becoming a barrier. People with vested interests who have the old experience of success are becoming too prominent in the high social status and forming the big opposing power. What I feel is that although the field is still strong enough, the enterprises are not utilizing it enough. Regarding its social background, I write a lot about it in my blog. My speeches can be also used as a reference. In these 40 years, the framework has been completed using the 3 poles of Japan, America and Europe. However, the composition is such that with the rapid growth of Asia, Japan in Asia is chased for the success. To seclude in pride or relief is not an option. The "investment" is not only about the country’s money or the tax system. They are only policies that are intended to prime the pump. In Japan the "government, industries, bureaucracy" with "big vested interests" has become too accustomed to the old experience of success and the centralized indirect finance of the mega banks, that their mentality became used to "financing" but not "investment." Even if financing is considered, the mental make-up is becoming such that they are not able to do the investment. The "stakes which come forth" (a Japanese idiom for "brilliant people who speak up") with spirit of great entrepreneurship are so few in the Japanese society. The situation is not good for new industries. It is difficult to be competitive about the industrial structure and economic growth in the paradigm of the new Global era. Since the industrial revolution, we saw the history repeat again and again in industry and economy. The new generation (regardless of age) must come. In the age of speeding information, the world knows much better about the Japanese situation. Think carefully about the above 2 graphs. How should it be interpreted? I am afraid that, as usual, "too little too late" policies derived from the old narrow personal experiences and logic of vertically divided thinking will probably come up. Can’t we change after all? Recently Japanese isolation and Japanese sinking are discussed in the media. Maybe it is so. There are a bunch of people in the authorities who always count reasons for not doing something, who have never experienced a serious match. Although the economic scale is 2nd in the world, Japan gives an "indifferent" or "irrelevant" or "nothing to do with" impression among the international society. It is predicted that China will get ahead of Japan in the GDP by 2010. I predict that talented people with high ideals will eventually go abroad to pursue their career. It is a shame, but this is what global era is about. After the speech, I headed to Narita and took off to Paris by the usual night flight. We live in a time of a rapidly globalizing and changing world. As the key players in nurturing the future leaders of the global community, many leading universities are urgently attempting significant and difficult reforms, in order to meet, indeed to anticipate and surpass the increasingly challenging needs of our global society. Various reports concerning the ranking lists of universities have become extremely popular with students and their families, as they seek the best opportunities to achieve their highest educational and career aspirations. Various stakeholders of society are looking hard for the best available talents. 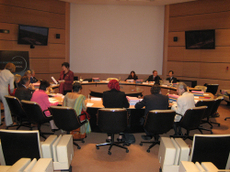 The internet and other means of modern communication, as well as the public relations strategies of universities, have all become crucial tools for their global target audience to evaluate each college and university for services that include faculty, student activities, vibrant dynamic course contents and potential future career opportunities. Yes, the time has come for future leaders to choose the best opportunities available to them. Universities now compete to capture the best and the brightest beyond national boundaries, so that the institution can become recognized as a top university of the world; the institution where global leaders, be it business, politics, education, research, social entrepreneurs, will be more likely to come from. The University of Tokyo has long been considered the best in Japan and it is expected to become one of the leaders of all the world’s universities. Its reputation and position in the global ranking has been quite high reflecting in part, the history of Japan and excellent government support. However, in the new global world, its evaluation seems to be slipping down, not because of quality or quantity of courses, but rather due to an insular system and a lack of openness, particularly, in the undergraduate college, where future leaders of a variety of social sectors will be nurtured. In the paradigm of an information revolution that has made our world ‘flat’ as per Thomas Friedman, key elements of creative, innovative and strong leadership must be harnessed through heterogeneity and diversity. The undergraduate years are a great opportunity to build a multi-layered human network throughout the world and a significant portion of courses should be given in English in order to create an added value for students to use in their further studies and in their careers in the global marketplace. Such courses conducted in English would also facilitate the attraction and employment of international faculty members of the highest quality, another key element of any leading university. 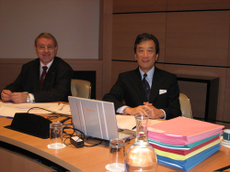 I am privileged to serve the President Council with its unique membership that so well reflects the intention of President Komiyama. I sincerely hope, as other members do, that the University of Tokyo will continue to strive hard to become widely recognized, by its global peers, as a leading university of the world in the age of globalization. Systematic reform of universities does not have the luxury of time, as the global competition will become harder and harder and the University of Tokyo, as its history reflects, has to play a leadership role to other universities of Japan, consistent with being a leading economy of the world.